The Autocall 4100ES is designed to handle complex facility requirements with ease. It brings fully addressable technology for both initiating and notification circuits and scalable design flexibility to medium and large facilities and multi-building campus networks. 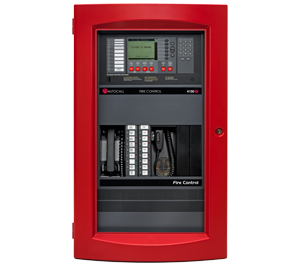 Supporting up to 2,500 addressable points, the 4100ES is networkable, offers system-wide voice notification/audio capability that is UL 2572 listed for Emergency Communications purposes, and is listed for multi-hazard suppression release control. An optional InfoAlarm large-screen display provides additional information and an intuitive, easy-to-use interface. Advanced technology makes everyone’s job easier – from contractors to facility managers and building owners – with improved installation andserviceability that can reduce costs and save time. Networkable, scalable, flexible and efficient design. Supports addressable notification and speakers.